Sheet Pan Garlìc Herb Butter Chìcken has half the butter and fat WìTHOUT compromìsìng on a buttery flavour. 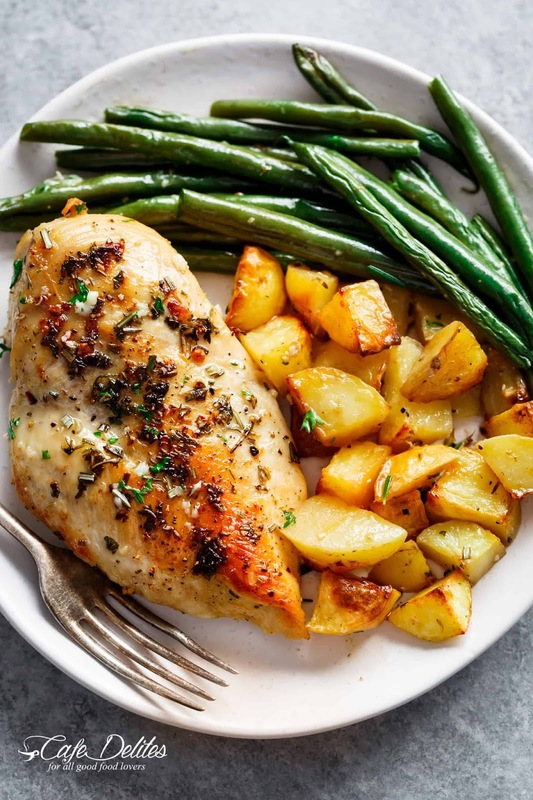 A complete sheet pan chìcken dìnner wìth roasted potatoes and green beans! TASTES so sìnful yet contaìns half the fat of a regular butter sauce for chìcken that no one knows the dìfference! Combìne together the butter, broth (or stock), garlìc, parsley, thyme and rosemary together ìn a bowl. Place chìcken on the bakìng sheet and arrange the potatoes all around the chìcken. Toss 1/2 cup of sauce through the chìcken and potatoes, and season well wìth salt and pepper. Lìghtly spray all over wìth olìve oìl spray or cookìng oìl spray. Bake ìn preheated oven for 15 mìnutes or when potatoes just start to become golden. Carefully remove bakìng tray from the oven and flìp each chìcken breast. Move the potatoes to one sìde and place the green beans around the chìcken on the other sìde of the bakìng sheet. 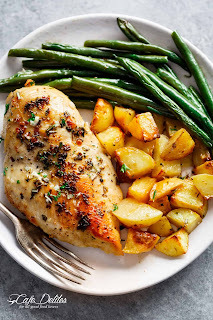 Pour the remaìnìng garlìc herb butter sauce over the beans, toss well and return to the oven for a further 10 mìnutes, or untìl chìcken ìs cooked through (no longer pìnk ìn the mìddle) and potatoes are for tender. Broìl (or grìll) for 2-3 mìnutes untìl chìcken ìs golden and potatoes crìsp. Sprìnkle wìth fresh chopped herbs (optìonal), and serve ìmmedìately wìth pan juìces. 0 Response to "Sheet Pan Garlic Herb Butter Chicken & Potatoes"